If you’re heading into your fantasy draft looking for this year’s hidden WR gem, in the words of Marko from Taken, “Good luck”. Let me put it like this, the first rookie RB going off the board is Leonard Fournette in Round 2 but the first rookie WR is Corey Davis going in Round 9! To go even deeper, only 5 rookie WR’s appear in the top 228 players drafted based on average draft position. That’s right, only FIVE rookie WR’s are being drafted out of the top 228 players and 4 of them after round 11! The Titans ruined everyone’s mock draft predictions when they drafted the WR out of Western Michigan with the 5th overall pick in this years draft. Personally, I was more confused than jumping into the middle of the movie Inception and trying to understand what’s going on. Corey Davis had 97 catches for 1,500 yards and 19 TD’s in 2016, and overall in his college career had 5,285 yards, which is a FBS record, and oh, by the way, he was number 2 all-time in TD’s, with 52. He’s now in a run-first offense that was ranked 25th in pass attempts in 2016, and they also have the dual threat QB from Honolulu. With so many options in the red zone, there’s no telling how much red zone work he’ll get. He’s easily one of my favorite rookie WR’s, but he injured his hamstring during practice last week and now is considered week-to-week with his injury. Hopefully the injury doesn’t linger on because he’s someone I’m interested in drafting with a late round pick, because of his upside, and you should too. This was the receiver all analysts projected to be the first overall WR taken in this year’s draft, but no one expected the San Diego Chargers to be the team that would draft him. They already have WR’s in Tyrell Williams and Dontrelle Inman who performed well last year in the absence of Keenan Allen, who is returning this year. Recent reports showed Mike Williams may need season ending back surgery, but now there is talk he may be able to avoid surgery. Either way, a crowded WR corps and missing time in the offseason doesn’t fair well for the rookie. Unless Keenan Allen, or any of the other 2 WR’s go down with an injury, I can’t see myself having him on my team at all this season, so drafting him is out of the question. Chargers wished rookie WR Mike Williams a happy birthday on Twitter. The speedster from the Washington Huskies broke the NFL Combine 40-yard dash record time with a score of 4.22, and with that, his draft stock quickly shot up, and so did the hype. Aside from AJ Green and Tyler Eifert, the Bengals market share includes Brandon Lafell and Tyler Boyd. Ross seems to have a good opportunity in this offense, but consistency could be in question. He had postponed repairing his torn labrum until after the combine, and as of now, he’s cleared for practice, but they will be breaking him in slowly. Being honest, he’s not worth drafting in leagues of 12 or smaller, but definitely worth keeping an eye on. This is one of the more intriguing rookie WR’s currently going off the boards in terms of opportunity. The East Carolina product was drafted in the 2nd round after having an impressive college career, all the while finishing as the all time receiver in FBS with 388 catches. The Bills current WR depth, aside from Sammy Watkins, is Andre Holmes, Jeremy Butler, Corey Brown, and Walter Powell. The Bills signing Anquan Boldin also takes away possible targets and red zone looks from Jones. Boldin was a red zone monster last year with the Lions, and I’m sure he’ll be the same on a Bills team that lacks red zone targets. As far as when to draft Zay Jones, hopefully it’s like a generous parents curfew… as late as possible. Samuel is entering an offense that is going through a complete makeover, so WR depth is up in the air. Samuel can essentially be lined up all over the field, similar to his teammate Christian McCaffrey. This is someone I wouldn’t draft at all, but will have one my list of players to keep an eye on during the first few weeks of the season. I’m not sold on Kelvin Benjamin after the year he had last year and him coming to camp looking pleasantly plumped. My hot take on Benjamin is that he will not be great at all this year either. My Fantasy Fact is that Carolina’s best WR this year will be Devin Funchess, and he will be the number 1 WR by the end of the year if he stays healthy. So, drafting Samuel in a 12-team or fewer league should not happen at all. Lemonsider Fantasy Facts is where a fantasy football (borderline obsessive) enthusiast brings you the goods you need to lead you to a championship which will allow you to flex your muscles and talk trash to your league members for months to come. Put your graph calculators away because formulas and algorithms that confuse many won’t be seen here. 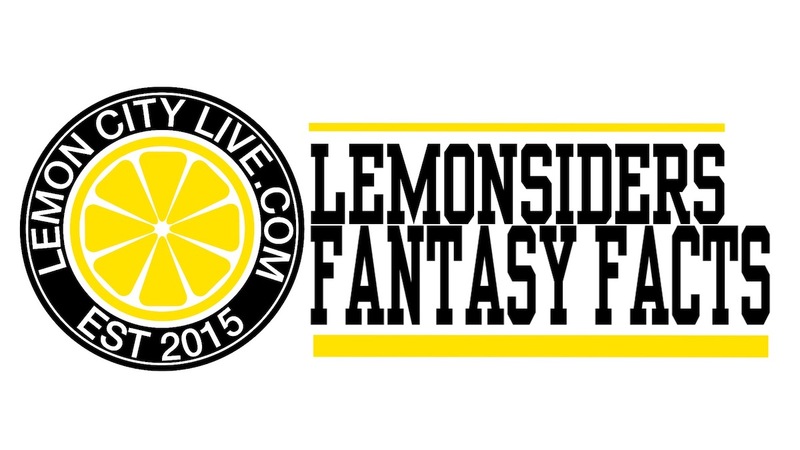 Will be serving up simple, easy to digest fantasy info for all you Lemon Heads.